LG OLED TV arrives in the UK | What Hi-Fi? The 55in LG 55EM970V OLED TV, the world's first commercial large-screen model, goes on display in Harrods' Technology department today – and it's available for pre-order at £10,000. The TV is just 4.5mm thick and weighs 10kg, yet combines Smart TV technology and Cinema 3D with LG's edge-to-edge Cinema Screen design. Brian Na, President of LG Electronics UK, says that 'We are proud to be the first in the world to offer consumers a big screen OLED TV. But if you want to have the LG 55EM970V at home, you'll have to wait a little longer: you can go to Harrods in Knightsbridge, London, to order it from today, but deliveries won't start until July. 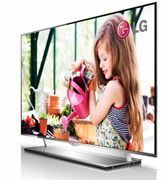 LG began selling OLED TVs in South Korea back in January, after showcasing a new range of OLED sets alongside a curved OLED TV and laser TV at CES 2013.